CreoPop, a 3D pen with cool ink, today announced that the company has raised a financing round led by Silicon Valley based 500 Startups. Imagine being able to draw anything you want in 3D?! The possibilities for artists to draw their vision in 3D, and even kids will be able to more creative in class. 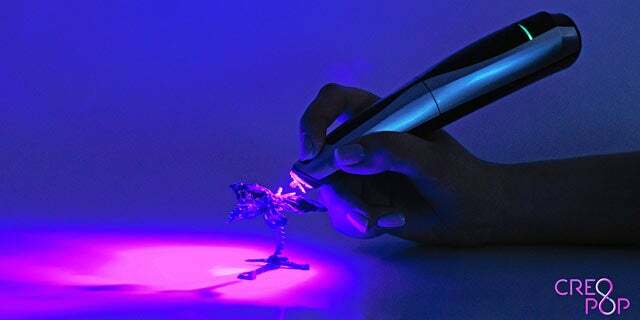 The CreoPop 3D pen uses light-sensitive ink called photopolymers. While this has previously been used for professional applications within the 3D printing industry, CreoPop is the first application of the technology in a portable consumer device. When CreoPop is operated, the ink is immediately solidified by LED diodes surrounding the nozzle of the pen. This is in contrast to other 3D pens that typically rely on heating ABS and PLA plastic to temperatures of around 250 degrees Celsius / 480 degrees Fahrenheit. Since no heating is required, CreoPop is safe in a home environment with children and pets around. The amount of the funding was not disclosed but in addition to 500 Startups it included Singapore-based venture capital firm Ruvento participated in the round together with a number of private co-investors. The most innovative feature of CreoPop is the large selection of cool inks available including different colors, elastic ink, magnetic ink, glow-in-the-dark ink, temperature sensitive ink and body paint ink. The price for the pen starts at US $110. Additionally, CreoPop has been selected as a finalist in the Innovative World Technologies Category for the 7th Annual SXSW Accelerator competition. Microsoft has quietly upgraded its Surface Book 2 offering, adding a newer processor to its 13.5-inch model and a price cut for the model it's replacing. The change isn't a huge one, but it's bound to be welcomed by those who have been waiting for a Surface Book update.